Look how nice our potatoes are looking. We won't bother them any more now till we start digging some. They are just about to bloom. They are the dark green at the back of the picture. The hoed plants you see to the right are my eggplants and peppers. You can just see the end of the cabbage etc at the front of the picture. 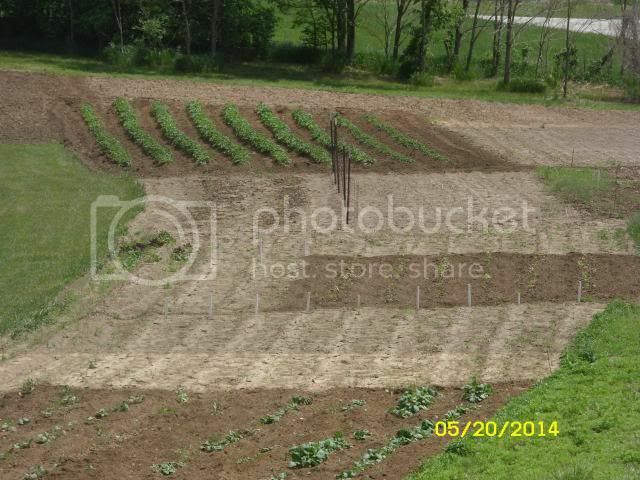 The beans are just coming through the ground. They are marked by the white pipe. Re: Look how nice our potatoes are looking. your garden is beautiful and BIG. I have only got my onion sets planted, still to cold. We had snow on the 16th. Normally plant on Memorial weekend.